What Did Children Think of Proms & Prosecco in the Park? We know that attending a classical music event is not often top of a child’s wish list, but last year over 300 children attended Proms & Prosecco in the Park and they had a fabulous time! Fizz Festivals aims to make classical music events unstuffy. No sitting in formal rows, coughing quietly in between each piece of music and clapping politely at the end of the concert! Our seating is totally informal; simply bring your picnic blankets, tables, chairs, candelabras, fairy lights and picnics and get set up in your chosen spot. There’s always lots to do even whilst the music is going on, from free children’s activities to loads of space to run about in, playing with friends, or enjoying delicious food and drink from our traders. And, you can clap, sing along, wave your flag and join in at any time you like! 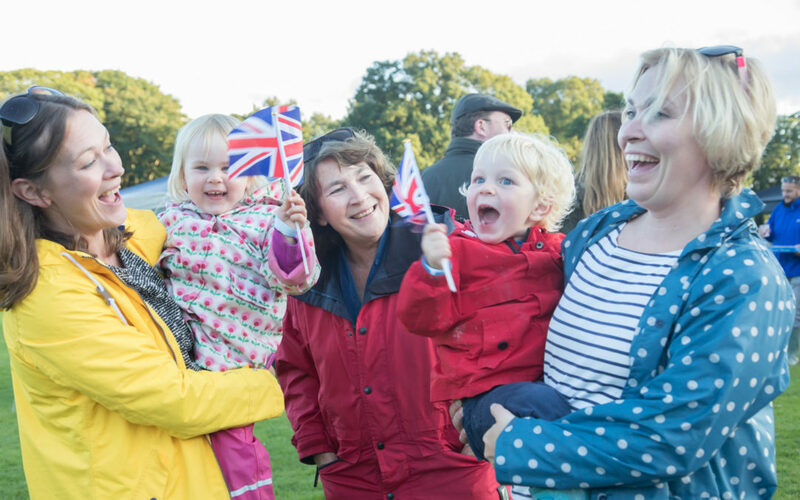 You will find that the park is awash with union flags, and a big friendly crowd singing along to their favourite tunes from the musicals, as well as much-loved classical pieces and all the Last Night of the Proms favourites! This year we have invited back our street entertainer and juggler to weave their way though the crowds and provide a little bit of magic. We also have free outdoor skills workshops for children, face painting, balloons, glow sticks for the evening, henna and much more! Oh, and did we mention that children under 13 go free?